Three Black Russian seedling were transplanted into individual pots. They will be under new type LED lamp in a 22 liter bucket then moved to the greenhouse when it warms up. The LED light is a full spectrum flood lamp from Home Depot cost about 22 dollars. This is my first use of LED’s. The advantage it is cool hence can be used in an enclosed space. A fan is used for some air movement to strengthen stems and to discourage mold.. The plants were started under a damp towel until germination about three days then grown in one pot initially. They will be planted outdoors about 25 of May. http://www.thompson-morgan.com/vegetables/vegetable-seeds/tomato-seeds/tomato-black-russian-heritage/319TM Information about this tomato. 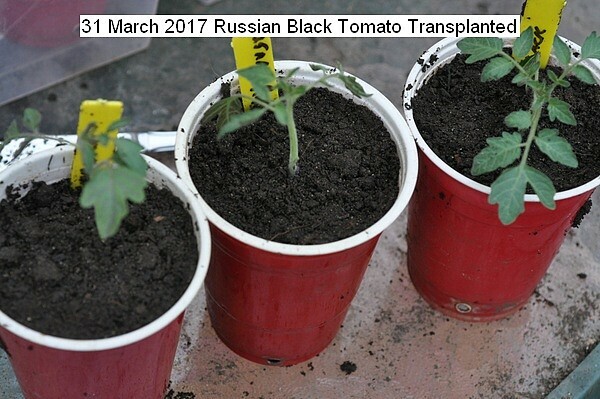 This entry was posted in Uncategorized and tagged 31 March 2017 Russian Black Tomato, Russian Black Tomato. Bookmark the permalink.